Posted on 30 July 2011. “Fresh diplomatic efforts are under way to try to end Libya’s bloody civil war, with the UN special envoy flying to Tripoli to hold talks after Britain followed France in accepting that Muammar Gaddafi cannot be bombed into exile. The change of stance by the two most active countries in the international coalition is an acceptance of realities on the ground. Despite more than four months of sustained air strikes by Nato, the rebels have failed to secure any military advantage. Colonel Gaddafi has survived what observers perceive as attempts to eliminate him and, despite the defection of a number of senior commanders, there is no sign that he will be dethroned in a palace coup. If the Gaddafi regime is now more in control of Libya than before, then this completely undermines the simplistic view put about by the supporters of war – and unfortunately by some elements of the resistance – that the situation was simply one of a hated tyrant hanging on through mercenary violence. Of course, he uses whatever resources he has at his disposal, but a) it would seem that the involvement of imperialism has driven some Libyans back into the Gaddafi camp, as it’s unlikely he would maintain control without some degree of support, and b) we know that rebellious sectors started to go back to Gaddafi within mere weeks of the revolt taking off, meaning in part that his resources of legitimising his regime were not exhausted even before the US-led intervention. Despite the defections, he has consolidated his regime in a way that would have seemed improbable in the early weeks of revolt. It’s important to bear in mind what this means. Both Ben Ali and Mubarak had the support of the US and its major allies – especially Mubarak. They had considerable resources for repression, and there was financial aid being channelled to them, talks aimed at offering reforms to the opposition … and in the end they proved too brittle, too narrowly based, to stay in power. The state apparatus began to fragment and decompose. The protests kept spreading, and withstood the bloodshed. Nothing they could offer or threaten was sufficient. Gaddafi, on the other hand, has hung on in the face of not only a lack of support from his former imperialist allies, but active political, diplomatic and military opposition. That he did so to a considerable extent through sheer military superiority doesn’t mean that the regime hasn’t a real social basis. Perhaps as important has been the weaknesses of the rebellion. I argued that the chief problem facing the revolt was that it had taken off before any civil society infrastructure had been built up to sustain the opposition. This meant that unrepresentative former regime elements were well placed to step into the fray and take effective control. As a result of the defeats they faced, those arguing for an alliance with Nato grew stronger and gained more control. There’s no question that if Nato really wanted to, they could defeat Gaddafi. It would, however, require a level of commitment (serious ground forces) that they aren’t ready to use. I think this is because, far from this being a pre-planned wave of expansionism by the US, the decision to launch an aerial assault constituted a desperate act of crisis management, which the “realists” in the administration were never particularly happy with. Only the zealots of “humanitarian intervention” could seriously have contemplated the kind of protracted, bloody land war in Libya that would have been necessary to win. So, the bet on an alliance with Nato now appears to have been doomed from the start, even on its own terms – even if the best outcome sought was nothing more than a slightly more liberal regime incorporated into the imperialist camp. Now, what can Libya expect? The leading war powers are once more bruiting negotiations, but to what end? Gaddafi may be persuaded to abandon direct control, in which case the result will most likely be a moderately reformed continuity regime, with ties to European and US capital fully restored. There appears to be little prospect of his going into exile. But that’s not all. The Transitional Council led by former regime elements continues to state that it is the only legitimate authority in Libya. It has been internationally recognised as such by a number of crucial powers. But this is pure cynicism. The imperialist powers know that the Transitional Council can’t control all of Libya. They’re certainly not taking any steps now to give them the military means to do so. So this means that the tendencies toward partition are sharpened. There are signs of such a resolution being offered as a “temporary” measure to secure the peace and allow some process of national reconciliation to take place (note that this conflict has increasingly been described as a civil war). This would be economically disabling for all of Libya, including those territories controlled by the rebels. It would also be dangerous in ways that I hope I don’t need to spell out. The final justification for this debacle will be that speedy intervention, however half-hearted, prevented a massacre. Now, there may once have been reason to believe this. But there no longer is. Gaddafi has enough blood on his hands, and deserved to fall to the insurgents, but there’s no reason to submit to war propaganda. In reality, as Amnesty put it, “there is no proof of mass killing of civilians on the scale of Syria or Yemen”. Which is an interesting way of putting it. It’s no secret that the coalition that was supposedly preventing a genocidal bloodbath in Libya was actually behind much of the bloodshed in Yemen. This completely demolishes the last leg of the moral case for war. The “humanitarian interventions” of the 1990s left the US in a stronger position, both geopolitically and ideologically. I’m not convinced that this will be the result of the bombing of Libya. In fact, if there was any idea that the US could offer an alternative model of development for the populations of the Middle East, it now lies in ruins. It is more than unfortunate that Libya had to be reduced to ruins for this to become apparent. ‘We are not going to recognize Israel. That is very simple. And we are not going to accept Israel as the owner of one square centimeter,’ says Mahmoud al-Zahar. Hamas has the Gaza Strip firmly under its control. Although Israel’s blockade of the salient is aimed at weakening it, money laundering and revenue from the smuggling tunnels under the border with Egypt has kept the radical Islamist movement afloat. The movement’s charter calls for an Islamic state to be established in all of historical Palestine (including Israel). Hamas leaders have firm views on the attempt by Palestinian President Mahmoud Abbas to get the United Nations to recognize a Palestinian state based on the pre-1967 borders, before Israel captured the West Bank from Jordan. The approach to the UN, he says, is a ‘political scam.’ He is equally unequivocal on the so-called two-state solution, which aims at an Israeli state and a Palestinian state existing side by side. Al-Zahar and Hamas are also uncompromising regarding Palestinian unity with Abbas’ Fatah party. After years of bitter, and at times violent conflict, which erupted after Hamas chased security personnel loyal to Abbas and the Palestinian Authority out of the Gaza Strip, the two movements signed a reconciliation agreement in May. But talks over the formation of a unity government, a clause in the deal, have floundered, as the two groups fail to agree on who should be the new Palestinian prime minister. Abbas wants Salam Fayyad, the current prime minister of the West Bank-based Palestinian Authority, to continue in the post. Hamas rejects this outright. “This man is not acceptable to us,” al-Zahar states flatly. Al-Zahar differs from other Hamas leaders regarding the efforts of a German official trying to mediate a deal which would see Hamas release an Israeli soldier it has been holding since 2006, in return for Palestinian prisoners freed from Israeli jails. Hamas spokesman Sami Abu Zuhri described the mediator, an official of the German Intelligence Service BND, as being “not a fair negotiator” and rejected all future cooperation. And what of the so-called Arab spring, the revolutions sweeping Middle East countries, which have overthrown the regimes in Tunisia and Egypt and threaten two more, in Libya, and in Syria, where the political headquarters of Hamas is located? Hamas spokesman Abu Zuhri dismisses speculation – at least publicly – that the movement would have to up and leave Damascus if its patron, Syrian President Bashar Assad, is overthrown. “We are guests in Syria and Lebanon as refugees. And also very important: We are not part of what is going on in Syria. We have no intention of leaving Damascus. We see no reason to leave Syria,” he says. Hassan Firouzabad accuses Israel of ‘fueling rightist sentiments, fostering terrorism, using world people as their toys in pursuit of objectives’. The head of the Iranian military on Saturday accused “the Zionists” of being behind the terrorist attacks in Norway, the Iranian state-owned English-language broadcaster Press TV reported on Saturday. Firouzabadi was referring to the double attack in Norway last week, in which at least 76 people were killed, many of them youth. Anders Behring Breivik, an extreme rightist, has claimed responsibility for both attacks, a shooting spree at a Labor Party youth camp on Utoeya island where he allegedly killed 68, and a bombing of Oslo’s government district, where he allegedly killed 8. Breivik claims to have acted alone. “The world should be on alert of the Zionist regime attempts to create deviation within Christianity and spread Christian Zionism,” the general added in the statement carried by Press TV. Iranian officials frequently accuse Israel, whom they often refer to as “the Zionists”, of being behind any incident with an anti-Islamic connection. TEHRAN (AFP) – A bombing of a pipeline carrying gas from Iran to Turkey early Friday was carried out by “mercenaries” in the pay of Israel and the United States, and forced a cut in supply, Iranian officials said. 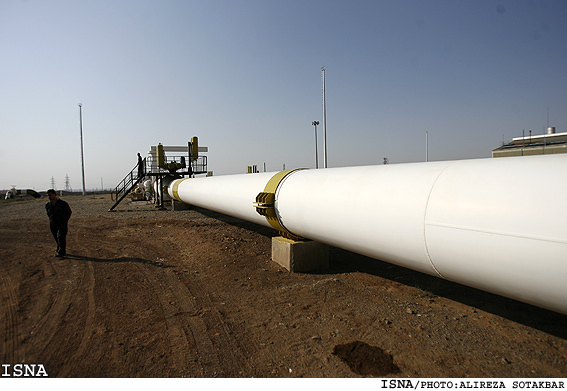 ”The export of gas to Turkey has been temporarily halted after an explosion struck the pipeline” in northwestern Iran, spokesman for the National Iranian Gas Co (NIGC) Majid Boujarzadeh told the oil ministry’s news agency SHANA. ”The bombing which left no casualties … occurred at the hands of Zionist and American mercenaries,” Maku Governor Hamid Ahmadian told the ISNA news agency. Bourjarzadeh said repair work on the pipeline was under way and expressed hope for a speedy resumption of the gas flow. It is not the first time gas supplies to Turkey have been disrupted. In the summer of 2010, it was damaged twice in blasts blamed on separatist Kurdish rebels. Iran, which has the second-largest proven gas reserves in the world after Russia, exports about 30 million cubic metres of gas to Turkey annually, according to deputy oil minister and chairman of the NIGC, Javad Ouji. Brussels – Norway will fly its last combat mission in Libya on Saturday, two days before the official end of its role in the Nato-led air war, an alliance official told AFP. Norway, one of eight Nato members that have conducted air strikes in the four-month-old operation, was the first to set an end-date for its participation when it decided last month to withdraw on August 01. “The last day Norwegian aircraft will fly on July 30,” the Nato official said. Norway originally deployed six F-16 fighters to the mission before reducing it to four last month. The government explained that its small air force could not sustain a large air contribution for a long period of time. Only eight of Nato’s 28 member states have flown bombing missions since the alliance took command of the operation on March 31: Norway, Britain, France, Canada, Belgium, Denmark, Italy and the United States. London has increased its contribution by adding four Tornado jets, effectively making up for the loss of the Norwegian planes. Nato officials say Norway’s departure will not affect the tempo of air operations, which have averaged more than 100 sorties per day including around 50 missions aimed at hitting targets. The Scandinavian country, beset by a bombing and shooting spree committed by a confessed far-right extremist, will continue its involvement in the operation with 10 officers posted at the Libya air command centre based in Italy. Why should the Palestinian people be forced to languish yet another year — or even one more day — under foreign occupation? They should not and they must not. This is the time to end the Israeli occupation. This is the time for Palestine’s independence. This is the time for Palestine and Israel to live side by side in peace and security, and this is the time for a new Middle East. We believe that the international community is ready for that, and we trust that the appropriate actions will be undertaken soon to make this a reality. Should Israel cancel the Oslo Accords, it would no longer be obligated to give the Palestinians food, fuel, water or anything, according to Mordechai Kedar, a lecturer in the Department of Arabic Studies and a researcher at the Begin-Sadat Center for Strategic Studies. “The minute the Palestinians go to the UN by themselves without Israel, they are abrogating the Oslo Accords, which clearly state that an agreement must be made by the two sides and that neither can go to an outside international body without the agreement of the other,” he added. Former French Foreign Minister Roland Dumas referred in a book he published entitled “Coups et blessures” (Assaults and Injuries), that “The “Israelis” are doing whatever they want in France, and are controlling the French Intelligence with what serves them”. On another hand, Dumas confirmed that the “Israelis” are mistaken not to negotiate with Syrian President Bashar al-Assad, even if the latter refuses any kind of agreement. He also added, “I made some special relations with him [Bashar al-Assad] like those I had with his father (President Hafez Assad)”. Furthermore, Dumas revealed in the same book that when current Zionist President, Shimon Perez was still the entity’s Foreign Minister, he advised Dumas to pay President Hafez Assad a visit in 1992. At that time Perez was aware that the US is seeking a new way to understanding with Damascus, so he [Perez] believed that France could also gain interest through being involved in the Middle East peace process. In this context, Former French Minister added, “The deceased Syrian President had little faith in Perez, and he knew the mazes of the internal “Israeli” relations”. Hafez al-Assad was aware that the “Israeli” Foreign Minister might adopt unilateral initiatives, and therefore it won’t lead into anything effective”. In his “Coups et blessures”, Dumas also mentioned the Islamic Republic of Iran, which he had visited several times and met its former Foreign Minister Ali Akbar Wilayati, and former President Hachemi Rafsanjani. Dumas strictly affirmed, “The Iranian atomic bomb is in my view similar to the weapons of mass destruction possessed by former Iraqi President Sadam Hussein, i.e. I don’t believe in all of that. I believe that all what occurred was a misleading of facts”. He also referred to that, “The confusion in the French policies goes back to known interferences, where “Israel’s” close presence makes all analysis suspicious”. On the same level, Dumas defended the Iranian point of view regarding the need to possess nuclear energy reactors, where its oil reserve might not last for more than 60 years. He confirmed that Iranian seek their civil nuclear program at the time when all reports refer to the non-existence of any nuclear weapons. In the context of his book, Roland Dumas clarified that former French Foreign Minister François Mitterrand had close relations with the “Israelis”, even if he wasn’t open about it. On another level, he confirmed that the “Americans did indeed plan to kill Libyan President Muammar Gaddafi through raiding him with planes in the 1986, referring to that France did not allow them to exploit its airspace for that. Gaddafi had thanked France for delaying the arrival of the US drones for more than 15 hours because of the French refusal, which gave Gaddafi time to leave the target place”. Regarding the “Israeli” policy adopted in the region, Dumas stated, “I don’t agree with the “Israeli” policy, and I was loyal to the balance principle founded by General Charles de Gaulle in the Middle East. The principle states that the Arab nations also have the right to respect, in addition to that the current “Israeli” policy inspired by activists close to Zionists is not on the right path”. Roland Dumas affirmed that the negotiations between “Israeli” Prime Minister Benjamin Netanyahu and PA President Mahmoud Abbass, will not lead to anything. He reiterated that the Palestinian-”Israeli” conflict is unsolvable, where US President Barak Obama stepped back from his pressures and warnings to “Israel” due to the Jewish Lobby pressure surrounding the US President”. Dumas indicated, “Any president or Western official to approach the Palestinian-”Israeli” conflict will collide into the settlers, and that is why they would reach the drastic end where “The solution is found in the absence of any solution”. Roland Dumas also criticized French President Nicolas Sarkuzy’s decision to include France in the united leadership of the NATO, believing that Sarkuzy made a big mistake in France’s traditional position set by Charles de Gaulle. Svein Sevje hopes conflict can be resolved in the spirit of Oslo Accords; says Norway still supports Israel. Norway’s ambassador to Israel told Haaretz Wednesday that in lieu of a negotiated peace treaty between Israel and the Palestinians, it is legitimate for the Palestinians to appeal to the United Nations, but that his country supports Israel, and has always supported it. The Oslo Accords between Israel and the PLO were struck in Norway between 1993 and 1995, and are the legal framework for the relationship between Israel and the Palestinian Authority in matters including security, economy and infrastructure. “The history of Norway vis-a-vis Israel is one of great support — all the time: from the inception, through all these years, a lot of support,” Norwegian Ambassador Svein Sevje told Haaretz on Wednesday, hours before boarding a flight back to Oslo. Norway is currently reeling from the shock of twin terror attacks carried out last Friday, in which a government building was bombed and 76 people are known to have been killed. The self-confessed killer is said to have published a manifesto decrying Muslim immigration to Norway and advocating for their expulsion from the country. The manifesto of the alleged killer also contains references to Israel, saying that it is on the front lines of a clash of civilizations between Judeo-Christianity and Islam. Most Norwegian people believe that Israel’s 44-year military occupation of the West Bank and the Jewish-only settlements built on that land are violations of international law and an impediment to peace, says Sevje. He hopes that the Israeli-Palestinian conflict can be resolved diplomatically, in the spirit of the Oslo accords. “That’s why a few weeks back, our foreign minister said we would like to see negotiations. But if the Palestinians go to the UN, we consider that legitimate. It can’t be unilateralism to go to the most multilateral of all organizations,” he says, disagreeing with the government’s contention that such a move would sabotage the possibilities for peace in the region. If the Norwegian government does not believe a Palestinian push for international recognition of its sovereignty to be illegitimate, or likely to lead to increased conflict, it may be partly because of Norway’s historic decision to dissolve its own national union with Sweden, just over a century ago, in 1905. “It happened without violence — it was a unilateral declaration of independence, and the Swedes accepted it,” says Sevje. The French government is struggling with damage control in the latest incident of civilian killings by NATO troops in Afghanistan, when French soldiers opened fire on a carload of civilians in Kapisa Province, killing three. The soldiers were operating a checkpoint in Kapisa and say that the car ‘failed to stop’ and was assumed to be a suicide bomber. Among the three slain were a small child and a pregnant woman. Preliminary reports have the French embassy issuing a formal apology for the killings, though NATO for its part simply reportts that “it appears that there had been no insurgents in the car” which was attacked. Afghan President Hamid Karzai condemned the attack and rejected the notion of an apology as meaningless. Civilian casualties have been on the rise over the past several months, with NATO killing increasing numbers in both air strikes and night raids.